According to a Mayo Clinic Study, doctors mistake virtually all recurrent sinus infections afflicting 37 million Americans as symptoms of the common cold. While the tell-tale symptoms–runny nose, coughing, sneezing, sore throat, and fever–could be the cold, sometimes, they’re the result of black mold exposure. Because black mold exposure, colds, and allergies cause nearly identical symptoms, it’s easy for doctors to misdiagnose their patients. So how do you know if black mold is the culprit behind your symptoms and not a cold? How do you find black mold? And how can you keep yourself healthy if you find black mold in your home? Black mold actually refers to several different species of dark green or black mold (a type of fungus). Mold thrives in warm, moist environments and tends to spread in summer months. It can grow on nearly any substance, including wood or fabrics, and in dark places with little exposure to sunlight. In your home, mold thrives in baths and toilets, kitchens, and other rooms where moisture accumulates. Finding mold in your house is hassle enough, but black mold can be especially dangerous to your health: over time, mold spores grow and multiply into larger colonies, releasing mycotoxins that can cause serious side effects especially in those with preexisting immune and respiratory conditions. 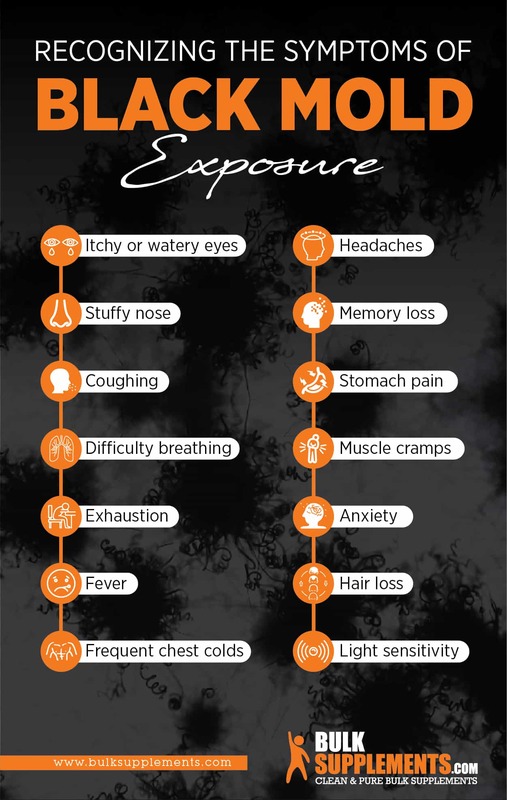 Since doctors typically cannot diagnose black mold exposure by symptoms alone, they may need to run different tests to see if you are suffering from the condition. Although blood and allergy tests can help to diagnose your symptoms, you also should conduct a home mold assessment to specifically diagnose an illness related to exposure. Blood Test: By analyzing a blood sample, your doctor can detect the presence of certain antibodies inside your immune system that react to mold species. This test can also check for the presence of mycotoxins in your bloodstream. Skin Prick Test: During this common allergy test, your doctor applies a tiny sample of mold to your skin via a needle. If you experience a negative reaction like a rash or hives, you most likely have a mold allergy. Alfalfa extract is a compound derived from concentrated natural alfalfa, which has been prized for its medicinal properties for thousands of years. Its anti-inflammatory effects could help relieve symptoms of black mold exposure. For the best results, stir one tablespoon of extract into a smoothie or beverage of your choice. Over-the-counter (OTC) allergy medication like Claritin and Zyrtec can help reduce your immune system response, which is actually the source of your symptoms. You can also take decongestants to open up airways and reduce swelling. Vitamin C is a powerful immune system booster. Research shows that taking 500 mg of vitamin C daily lowers bad cholesterol while helping you fight tough infections and colds resulting from black mold exposure. Doctors often prescribe antihistamines and OTC nasal corticosteroids such as Flonase together to help decrease airway inflammation. You can also use a mixture of warm water and saline to rinse your nasal passages to reduce congestion. If your reaction to black mold is particularly strong, your doctor may prescribe regular allergy shots to help boost your body’s immunity. Montelukast, commonly sold as Singulair, is a prescribed oral medication that reduces mucus buildup, helping to relieve mold allergies along with asthma symptoms. There are many natural methods and supplements for treating black mold exposure. More than anything, you need to boost your body’s immune system and respiratory function so you can fight not only black mold, but also improve your overall health. Garlic tops the list of natural remedies. It has incredible anti-fungal abilities— exactly what you need to combat the symptoms of exposure. Doctors recommend taking 600 to 900 milligrams of tablets daily to kill off fungi and yeast. Another powerful supplement is acai berry. Acai is an antioxidant powerhouse with many benefits including improving cardiovascular health. 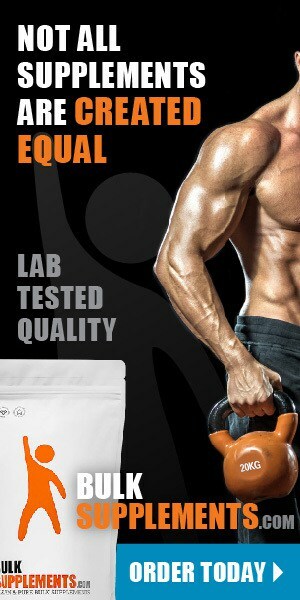 It also increases metabolic efficiency to help flush the toxins out of your system better. There are no known serious side effects of acai, and doctors usually recommend taking between 1,000-4,000 mg daily. Another option is grapefruit seed extract. This is particularly beneficial for those who can’t stand the smell of vinegar (another effective anti-fungal agent). To use, combine roughly 20 drops of extract into two cups of water and spray it directly on the mold source. You can also take it daily as a supplement by mixing five drops into water, tea, or a beverage of your choice. Tea tree oil is also a natural anti-fungal. To treat fungal infections, mix two to three teaspoons of tea tree oil with two cups of water in a spray bottle and spray directly on the affected area. To avoid a burning sensation, you may want to dilute the mixture in lotion or water, or try using a smaller amount. Prevention is the best medicine–this is particularly true for black mold exposure. The most important factor in preventing mold growth is controlling the moisture levels in your home. Be sure to check areas particularly susceptible to water leakage and high humidity, and quickly address any leaks or areas where water may be getting into your home. For high humidity rooms such as your bathroom, be sure to install an exhaust fan and ensure the room receives a steady airflow and plenty of natural sunlight if possible. Overall, you should aim to keep the humidity level in your home below 50 percent. If you live in a humid climate, dehumidifiers and air conditioners can radically reduce the risk of black mold buildup. Even smaller measures like hanging up your towels after taking a shower or properly drying your utensils can go a long way in preventing black mold growth. If you do have a black mold outbreak, it’s critical to find the source of it in your home and eliminate it as soon as possible. This begins by conducting a mold analysis throughout your home. Make sure to target trouble areas like bathrooms, kitchens, and basements. From there, you can then remove the mold using either chemical or natural cleaning methods. Do note that even if you are able to identify the mold sources in your home, it may grow back again. You need to routinely check trouble areas and keep them clean. When cleaning up black mold, make sure you minimize your exposure to it. Whether you use natural or chemical cleaning agents, be sure to wear a mask and gloves while cleaning any surfaces, and cover any exposed areas of your skin, as some mold particles will become airborne during the cleaning process. If your mold infestation is especially out of control, don’t tackle it yourself; instead, hire a professional with the tools, equipment, and experience to safely and effectively remove the mold. 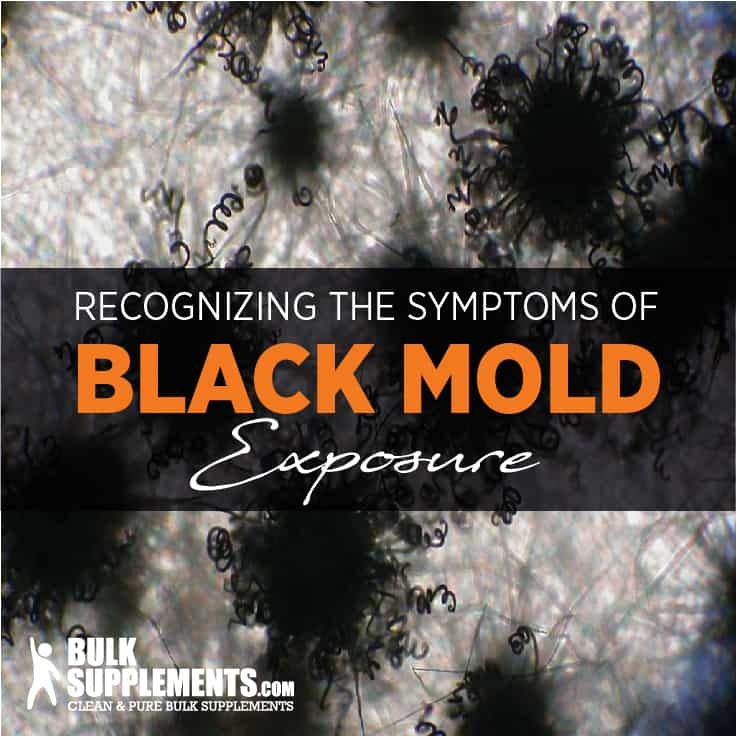 You can find plenty of natural and safe supplements to help treat the symptoms of black mold exposure. Vitamin C and Alfalfa Extract are two proven ways to fight inflammation and other mold-related symptoms. Best of all, they ‘re natural and healthy additions to your balanced diet.